A better way to evaluate and improve your board. The Board Institute can show you how. The Board Institute provides directors with independent, world-class evaluation tools to assess, enhance, educate and benchmark the effectiveness of your boards, committees and directors. Created in collaboration with market experts in evaluation, survey research and board governance, our scientific, accredited and comprehensive solutions will provide you with a clearer understanding of how your board is performing, will enhance and streamline your entire evaluation process, and ultimately lead to improved corporate governance and better financial results. 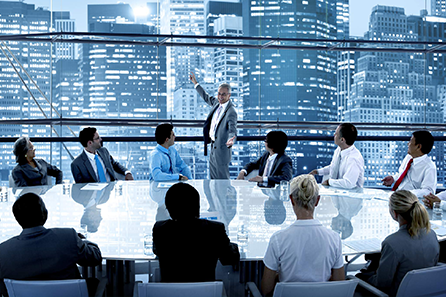 The goal of The Board Index is to help your board be the best it can be by assessing and enhancing its effectiveness. The Board Index helps directors and officers of public and private companies assess and enhance the overall effectiveness of your board by focusing on the structure and composition, the role of the directors and the leadership of the board. The Audit Committee Index helps you determine how to make your Audit Committee more effective by revealing strengths and weaknesses in the Audit Committee’s structure, policies and practices. The Compensation Committee Index helps you determine how to make your Compensation Committee more effective and demonstrate best practice to your constituencies and the markets. The TBI Protiviti® Board Risk Oversight Meter™ allows your board of directors to assess, improve and benchmark the effectiveness of your risk oversight processes. More importantly, it allows directors to be confident they are effectively overseeing risk. The Director Index is designed to help directors become more effective and optimize their performance objectively, safely and securely. The Fiduciary Board Index module allows boards of directors to assess the strengths of their investment policies and highlight areas for improvement. The goal of The Norwegian Board Index is to help your board be the best it can be by assessing and enhancing its effectiveness. Boards of directors can spell the difference between success and failure. Great boards mean great companies. 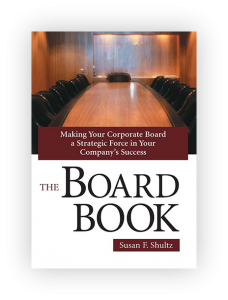 In The Board Book, author and Board Institute founder, Susan Shultz combines over 30 years of experience and expertise in corporate governance to help you learn how to avoid the 10 most common mistakes and create a strategic force in your company’s success.